Though it may lack the iconic title, Sega Racing Classic has been confirmed as a high definition remake of Saturn-era racer Daytona USA. 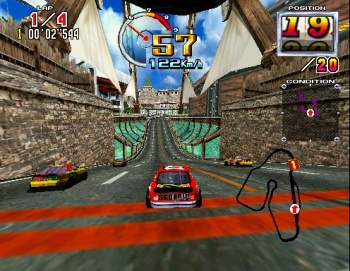 Pictured at right, the original Daytona USA was created by Sega's AM2 development team. Happily for fans, AM2 is also in charge of this new iteration. Official confirmation of the remake comes courtesy arcade supply site Highway Games, who offer not only images of the full sized, car-style cabinet, but also say the game will run on a 32" widescreen LCD at (a slightly underwhelming) 1280x720 resolution. Up to four of the garishly colored, quarter-ton cabinets can be linked together for networked racing action. Perhaps most notable is word that Sega Racing Classic runs on Sega's new "Ringwide" arcade tech. This likely means nothing to the average American, what with the arcades in this country as numerous and prolific as the once-mighty esquilax, but it should make the game very, very pretty. Now we just have to keep our fingers crossed, hoping Sega remembers to include the virulently catchy Daytona USA theme song alongside Sega Racing Classic's Attract Mode.